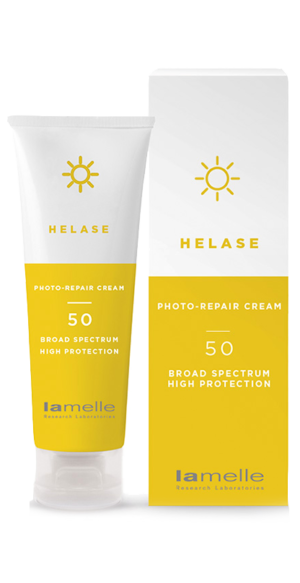 Lamelle Helase 50 is an innovative photo-protection sunscreen that has the ability to not only prevent sun damage but to also repair damaged DNA. It protects the skin from the harmful effects of the full solar radiation spectrum including Visible Light and Infrared radiation. Suitable for all skin types except very oily skins. Key ingredients include filters that protect against UVA and UVB radiation. AhR inhibitors protect against skin ageing by preventing inflammation, and by reducing the immunosuppression of the skin which if not controlled can lead to photo-lesions and skin cancer. Photolyase enzyme derivatives repair direct DNA damage that is caused by UVB, while OGG-1 Enzyme antagonist protect against indirect DNA damage caused by UVA. TRPV1 receptor antagonists protect against Infrared Radiation, especially the IRB and IRC, by preventing excessive heat and inflammation in the skin which can lead to ageing due to enzyme activation. Also protects against Visible Light which includes High Energy Visible Light (HEVL) which can cause pigmentation in darker skin types. Pycnogenol a potent antioxidant protects again free radicals produced by UVA and absorbs some UVB while suppressing inflammation. Dr. Webster’s Recommendation: This advanced, sophisticated sunscreen is one of the few products available on Dermastore® that is able to protect skin from the entire solar radiation spectrum (UVB, UVA1, UVA2, Visible Light and Infrared) and help repair damaged DNA. In real-world practicality, it is a very effective broad-spectrum sunscreen that repairs DNA damage, thereby helping to prevent the formation of skin cancer and skin ageing. Research has shown that those with darker skin types, who have prolonged exposure to screens such as cellphones, tablets or computers, have an increased risk of pigmentation as these devices produce High Energy Visible Light (HEVL) which lies within a narrow band in the Visible Light spectrum. Apply an appropriate amount of the product to the face or exposed areas of concern and ensure to rub the cream into the skin. 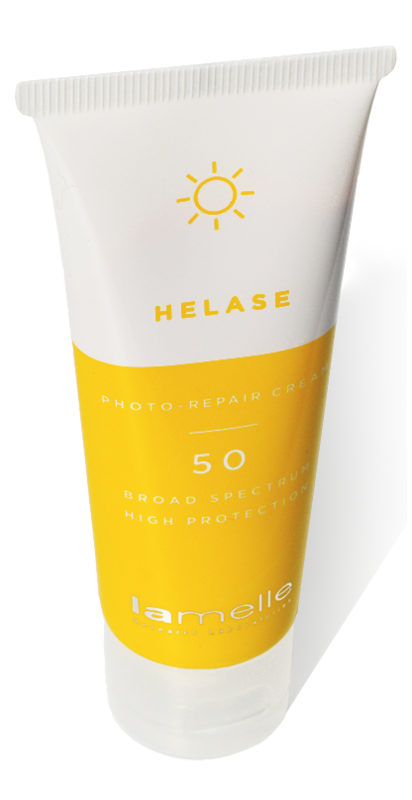 Helase is not waterproof and should be applied 10 - 15 minutes before exposure and re-applied 3 - 4 hourly if possible. It’s a very good, comprehensive sunscreen, especially because more companies are advertising protection beyond just UV rays. The formula could spread a bit better, especially since a good even layer of sunscreen is critical in delivering on the sun protection claims. I’m not sure why Lamelle choose to formulate with benzophenone-3. There are less controversial filters out there that don’t penetrate the outer layer of skin, have lower rates of contact allergy, and don’t show the same levels of hormone disruption. That being said, I still use it, especially because it contain photolyase for active sun repair. This product has a PFA of 18 and a critical wavelength of 378nm (this information comes from Lamelle itself). I bought this product before and am very happy with it. Not the application or colour is a problem at all. Prevents and repairs actinic damage.